These garment bags have everything you need! 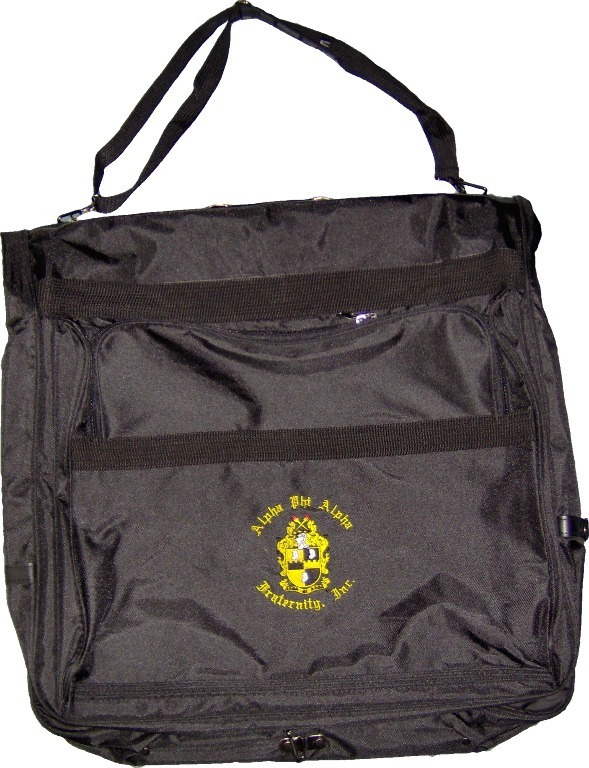 Your embroidered organization crest and name embroidered front and center. They measure 24" wide x 50" long when fully opened. They have a chained hook to easlily hang your bag in the closet (the hook easily tucks away for storage), two large shoe/toiletry pockets inside (when folded), and two large pockets on the outside of the bag. Hang your suits or dresses on the bar inside the main long zippered compartment with your own hangers. Holds 2-3 suits with ease, plus your toiletries, and other smaller clothing items. Hook the sides together, so everything stays put inside. It's perfect for a quick business trip or weekend getaway. Alpha's full fraternity name is embroidered in Old English font around the group's crest, or choose a your font. These bags have a shoulder strap as well as a carry handle. Customers who ordered this bag also looked at our coordinating Rolling Duffel Bags in the "Great Gifts Galore" - "Gifts that Carry Stuff" Section.